The next major event lined up for the electric racing calender is the Pikes Peak International Hill Climb. The list of electric challengers in 2014 is smaller than in 2013, but a return entrant is Drive eO. Last year the team ran with a custom built electric car, the PP01, but didn't finish the race. This year, the team is returning with a Tesla Roadster sporting a custom drive train, the PP02. 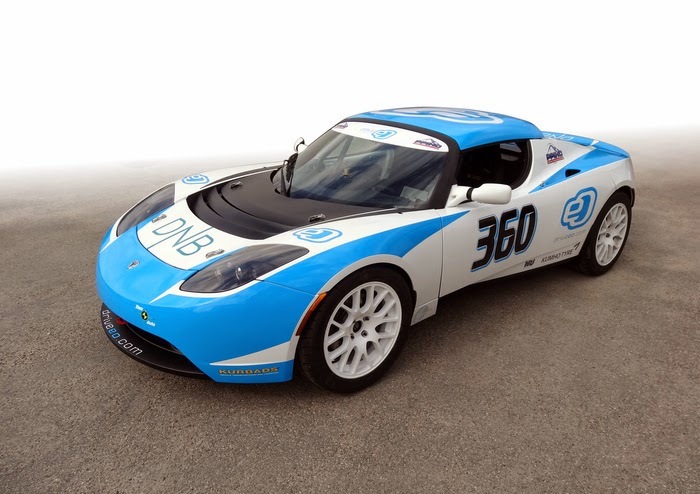 Rather than the stock Tesla drive train - which would quickly go into thermal protection mode if they tried to seriously race it up Pikes Peak - Drive eO installed a 360 kW (peak) twin-motor system and a 40 kWh lithium-ion battery pack. They're hoping to use the 2014 car to test drive train components "ahead of scaling them up for successive electric supercar projects which are already on the drawing board." If you grok Latvian, this video will tell you a lot about their plans. It's clear they did more than just replace the drive train - they worked on suspension and other parts.